It's the end of November and what does that mean? Clocks have gone back an hour. Days are getting shorter. The weather is getting colder. Winter tires are going on and holiday baking is hitting full steam! Which means, the 6th annual, award winning, 12 Days of Cookies is coming to a library near you. For twelve days, the staff and friends will be baking and sharing recipes and cookies. Each recipe, along with pictures, will be shared online via Twitter, Instagram, Facebook and on this blog. All branches and the Bookmobile will be taking part in this cookie extravaganza, week days beginning Monday, December 5th and ending on December 20th. There is also a contest to encourage public participation and a chance to win a "cookie gift bag'. Contest rules are available on the AVRL website. This is a fun way to showcase the library's collection of cookbooks and magazines, especially during the holidays when many are baking. In the coming days the staff of AVRL invite you to come see and taste what has been baked. Visit this blog to see which branch will have cookies that day for your tasting pleasure. happens each year after Black Friday and Cyber Monday. It’s a time when Canadians, charities and businesses come together to celebrate giving and participate in activities that support charities and non-profits. There is no “right” way to participate as long as it supports generosity and giving. Donate, volunteer time, help a neighbour, or spread the word. 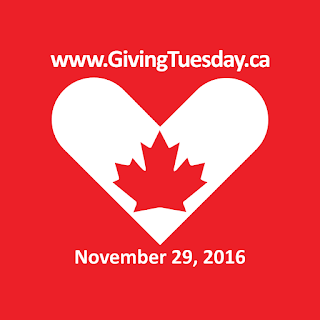 GivingTuesday Canada was founded in 2013 by the GIV3 Foundation and CanadaHelps. Here at AVRL, we are encouraging you to help us furnish two library projects. Our Berwick branch is set to open sometime in January. We still need to raise around $47,000 to fully furnish the library. In Bridgetown, the library expansion is nearly complete. We still need $2000 for furniture in the children’s area and the meeting room. Both of these library projects have had amazing support. In Berwick there have been fundraisers that have been well attended by the community, local families have donated, and businesses, such as Kings Mutual Insurance, have stepped forward to donate. In Bridgetown, the annual Silent Auction brought in nearly $4000 towards the project. In each of these communities, the Friends of the Library have been instrumental in gathering community backing. There’s not enough space here to individually thank each and every one of you who have been helping our libraries, but please know that we are incredibly honoured to have your support. So, when November 29 rolls around, and you want to help us finish these library projects, this is the time! We’ll even give you a tax receipt for donations of $10 or more. If you have bonds or securities you want to donate, we can do that too. To donate, visit this page. Or you can donate on the GivingTuesday site; please leave us a message regarding which library project you want to support. If you send us a cheque, please print the form for the library you want to support. If you have any questions, please feel free to phone us at 902-665-2995 and we can help you! Does someone you know have a long overdue library copy of the book On South Mountain, by Alison Griffiths and David Cruise? Do you? PLEASE HELP! Over the years, almost all of the library's copies of On South Mountain have disappeared. They weren't stolen, exactly. They were legitimately signed out from the library, but then never returned. Patrons have moved and contact information is outdated. Please help us -- we need them back. The subject matter is a dark, but significant, chapter of Annapolis Valley’s past. We receive ongoing requests for the title, and it remains out of print. If you are in possession of one of these books, please return it to us. If an acquaintance/friend of yours has it, please implore him/her to see it safely home. It could be returned to any N.S. library and it would find its way back to us. A new OverDrive site is coming to you on November 9th. The site has a cleaner look with less clutter. You can visit our current site for a preview. · The site promises to be faster and easier to navigate. · You will be able to sign in with either a library card and PIN, an overdrive account, or a facebook account. Because we have an Advantage Collection (where we purchase material exclusively for our users), you will not need to choose the library after the first time you sign in. Using cookies on your computer or device, OverDrive will remember which library you are using. · Browse collection based on subject terms. · When logged in, you can see what titles you currently have in your loans (borrowed), on hold, etc., in the banner on top of the book cover. · The book icon at the top of the page is a shortcut taking you right to your loan page. · Auto complete is enabled in the quick search, offering suggested titles, authors, etc, that begin with your first letters/words typed. · You can now choose a lending limit from a "Borrow" drop-down menu on the item. · A "recommend to read" list will appear after you place a hold, displaying titles similar to the one on which a hold was placed.